Overhead Door Sales and Home Improvement have been in business since 1965! With 50 years of experience in a wide range of home improvement services for our customers in Dayton, Centerville, Beavercreek and Huber Heights Ohio, you can count on us to do your job right. Whether it’s siding, roofing services, garage doors, entry doors, seamless gutters, or restoration services, we have the expertise to satisfy our customer’s highest expectations. 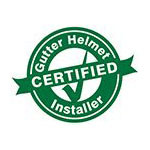 We are a certified Gutter Helmet dealer trained in the installation of this patented gutter protection system. Gutter Helmet is the original leaf shield used on thousands of homes and businesses for over 30 years. With this kind of history and record of accomplishment, you know that it has to be a worthwhile and effective product. We wouldn’t install GH if we didn’t believe it was the best system available. Why do we install so many of these remarkable gutter covers on our client’s homes? Homeowners get tired of constantly cleaning out their gutters and many know that a rain gutter is there for more than just looks. Without them, rainwater coming off the roof won’t be channeled to the downspout and away from the home. Rain would just go straight to the ground eroding the soil around the foundation, splashing mud on the siding and cause a host of moisture related problems in the home. End your gutter cleaning days and protect your home from water related damage caused by clogged rain gutters. Contact Wayne Overhead Door Sales & Home Improvement for more information about our services by calling (866) 547-735 or by filling out the online form here. We look forward to providing all of your home improvement needs!